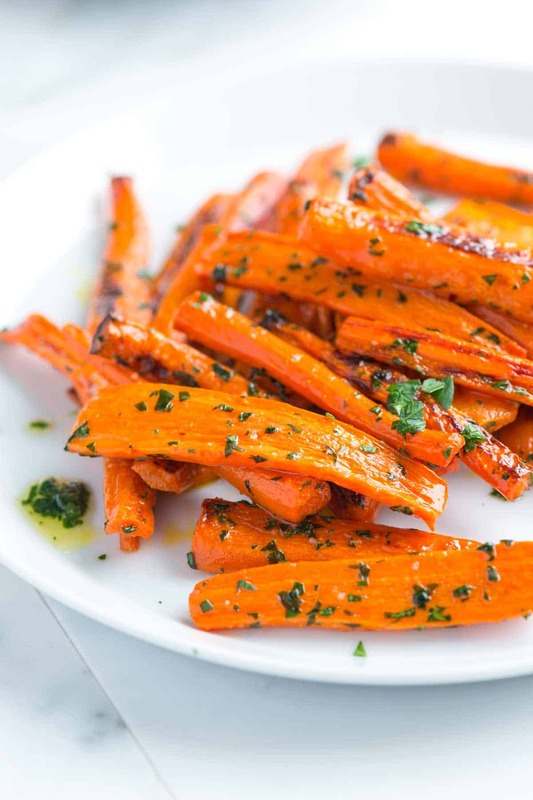 Easy roasted carrots recipe with a garlic parsley butter. The carrots are sweet, tender and completely delicious. Jump to the Roasted Carrots Recipe or read on to see our tips for making them. 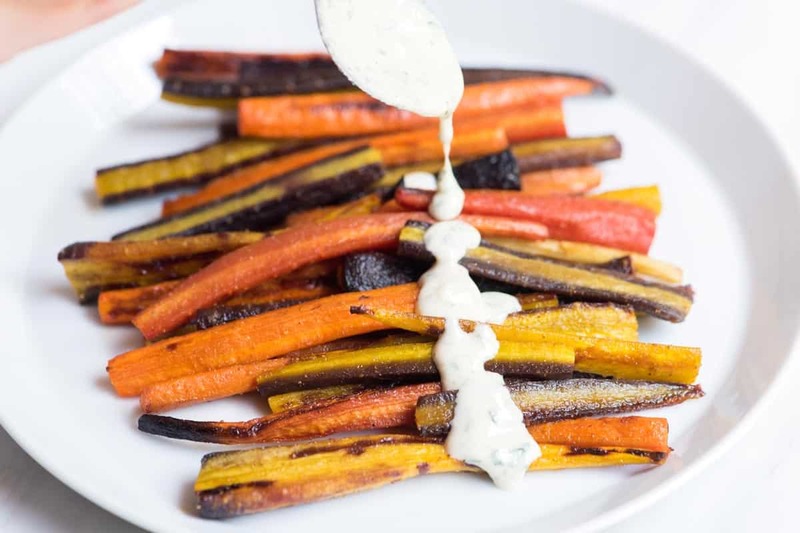 YOU MAY ALSO LIKE: This 20 Minute Honey Roasted Carrots Recipe with Tahini Sauce. A simple recipe for roasted carrots with honey, spice and the most delicious tahini sauce drizzled on top. Carrots are a staple for us. We make some version of this every week. 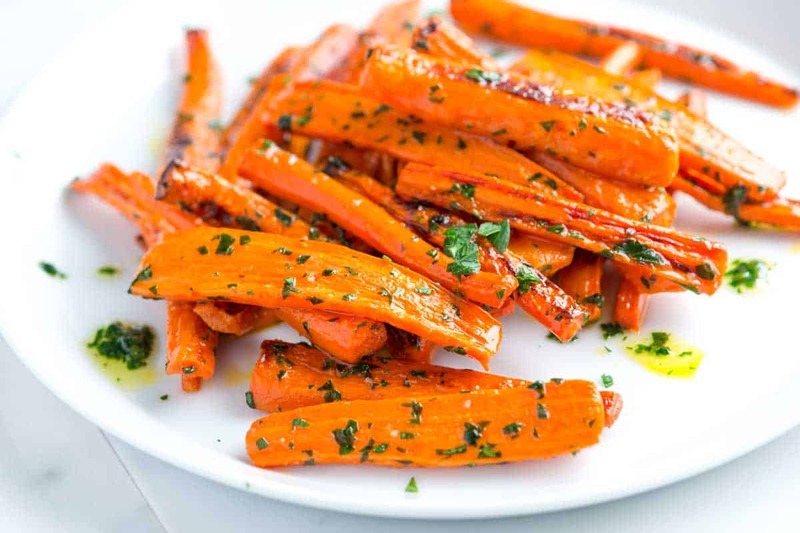 Whether you toss your carrots with parsley butter, olive oil or have them plain, you’ll want to know the deal when it comes to roasting them. It’s a great trick to keep up your sleeve for the next time you’re searching for a dead simple side. The method is very simple and can be used to roast most hearty vegetables. Parsnips, onions, sweet potatoes and squash being our current favorites. For roasted carrots, heat your oven to a high temperature – we like 425 degrees F. Toss the vegetables with a little olive oil, melted butter or other fat (coconut oil would be nice). Season them with salt, pepper and any other seasoning you love then roast for 25 to 30 minutes until tender and the edges begin to brown. Once roasted you can enjoy alone or toss them with a garlic parsley sauce. It’s absolutely divine. Serve these roasted carrots next to Whole Roasted Chicken, Baked Salmon with Lemon and Dill and our Roasted Pork Tenderloin with Apples and Onions. For more easy side dishes, check out our Garlic Roasted Brussels Sprouts with Ham, Guilt-Free Mashed Cauliflower, Coconut Oil Roasted Sweet Potatoes and these Ginger Butter Sautéed Green Beans. 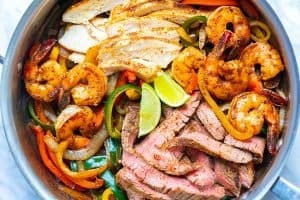 The recipe below is more of a template than a strict recipe. Carrots are perfectly delicious roasted, but so are parsnips, squash, potatoes or other hardy vegetable you find in season. Feel free to switch them out for something else. 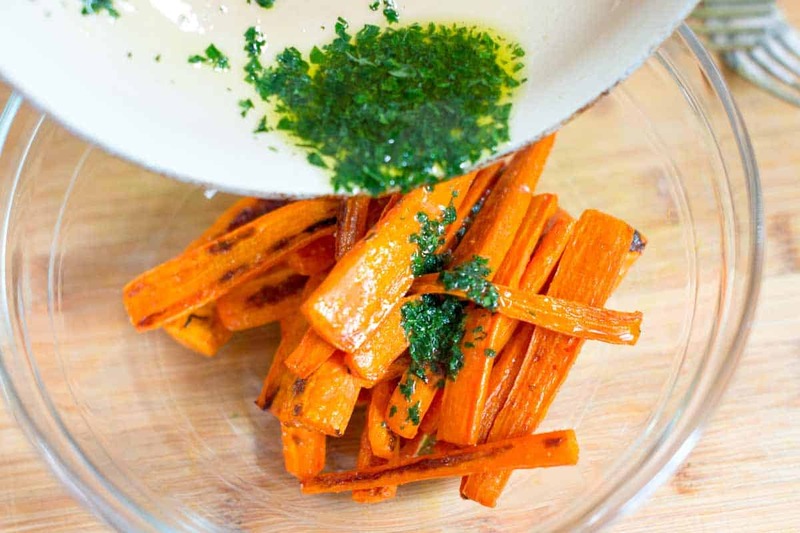 Here we toss roasted carrots with butter that’s been infused with garlic and parsley. Instead of the parsley, consider adding basil, crushed red pepper flakes, dill, cumin, or other favorite flavors. Heat the oven to 425 degrees F and line a baking sheet with aluminum foil. Cut carrots into 2 to 3-inch sticks. (Depending on how wide the thicker ends are, you may need to slice each stick in half, lengthwise). Toss carrots onto the baking sheet with the olive oil and salt. Make sure the carrots are coated then spread out into one layer. Roast carrots, stirring twice, until they are tender with edges that are lightly browned, 25 to 30 minutes. How many servings does this make? 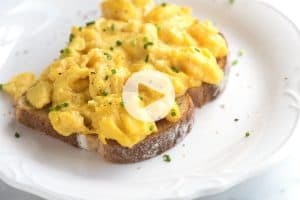 Has anyone tried making the garlic butter the day before and just warming it up quickly to add to the roasted carrots the next day? The recipe makes four servings. The parsley butter can be made in advance. 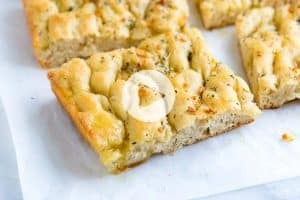 My husband LOVES these, especially when I make them with purple carrots. 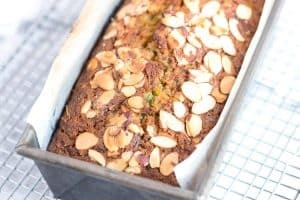 because of this, and how easy they are to make and because I ALWAYS have carrots in the fridge it is one of my go to items when having a dinner party. Who doesn’t like carrots? Sounds lovely will try it. We always thinly coat the carrots with olive oil and ras el hanut spice, which is jzst like you get it from the Arabian mazza places. To die for! And works great with hummus. So glad you enjoyed them so much! Made these for dinner, they were delicious, will definitely be making them again. Thank you for sharing. Wonderful, so glad you enjoyed them!